I’m not one to play the card game, but i do play the ds and gameboy games. i am only on this website because they look pretty/cool. Looks a lot like the Mewtwo in Super Smash Bros. Melee. Same modeler? maybe the only RS ex pokemon that’s actually better than the original card. Based on successful usage? Nope. 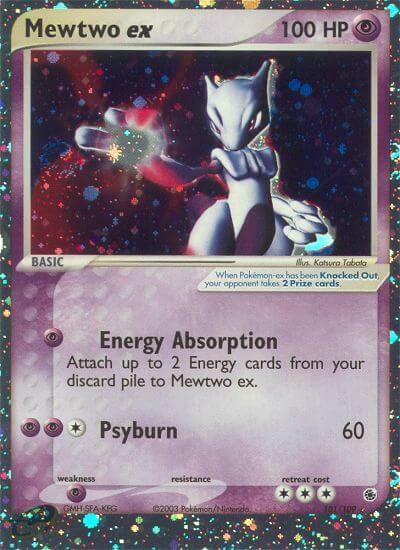 Mewtwo (WotC – Black Star Promos 3, 14) once dominated the Standard Format… back when Standard was the same as Unlimited. ;) Though it seemed like “forever” at the time, it was probably only for a few months. Still, I believe that is more than the above Mewtwo-ex managed. There was a lot of hype for the card (several of the other basic Pokémon-ex in this set, too) because we all still remembered the Basic-dominated early days of the game. The Pokémon-ex mechanic helped mask the fact that these Basic Pokémon-ex cards weren’t actually keeping up with power creep… or maybe it was just that we received pre-errata Rare Candy in the next set (EX – Sandstorm), Double Rainbow Energy not long after, and, of course, strong Stage 2 Pokémon that came bundled with a strong Stage 2 Pokémon-ex counterpart.